Another month, another Daring Bakers challenge. This month’s challenge was cake and, due to a hectic work schedule and then vacation (woo-hoo!) it came down to the wire for me this month and I baked this up at the last minute, unfortunately with no real reason for having a cake on hand. That means that Dan and I are currently staring at a very large party cake with equal parts delight and trepidation … just how is all of that cake going to get eaten? Tomorrow I will have to make the rounds and share some cake with the neighbors. I had to make some adaptations to the recipe to make it vegan. For the cake I replaced buttermilk (with soymilk and cider vinegar), egg whites (with soy yogurt), and butter (with Earth Balance). The icing was a whole other challenge altogether: a merengue buttercream frosting. Oh my. The one thing I have not yet figured out how to veganize is merengue. 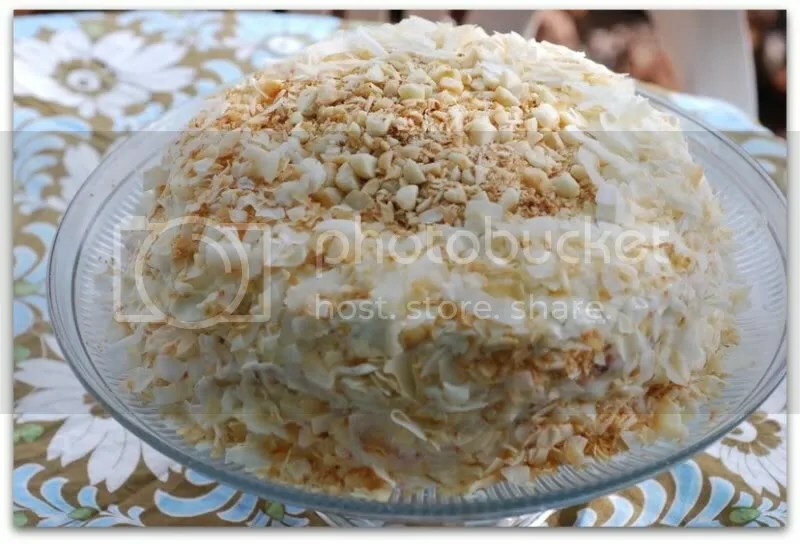 Instead of spending hours pulling my hair out trying to figure out how to replicate merengue, I made a lemon buttercream frosting, toasted some coconut and macadamia nuts (becuase I live in Hawaii and have lots of them in the kitchen), and smothered the cake in the toasty goodness. 1. Center a rack in the oven and preheat the oven to 350 degrees F. Lightly grease and flour two 9 x 2 inch round cake pans. 2. Mix the cider vinegar with the soymilk and set aside. 3. Sift together the flour, baking powder and salt. 4. Whisk together the soymilk mixture and soy yogurt in a medium bowl. 5. Put the sugar and lemon zest in a mixer bowl or another large bowl and rub them together with your fingers until the sugar is moist and fragrant. Add the Earth Balance and, using a hand mixer, beat at medium speed for a full 3 minutes, until the EB and sugar are very light. Beat in the lemon juice. 6. Add one third of the flour mixture, still beating on medium speed. Beat in half of the soymilk mixture, then beat in half of the remaining dry ingredients until incorporated. Add the rest of the soymilk mixture beating until the batter is homogeneous, then add the last of the dry ingredients. 7. Finally, give the batter a good 2- minute beating to ensure that it is thoroughly mixed and well aerated. 8. Divide the batter between the two pans and smooth the tops with a rubber spatula. Bake for 30-35 minutes, or until the cakes are well risen and springy to the touch – a thin knife inserted into the centers should come out clean. Transfer the cakes to cooling racks and cool for about 5 minutes, then run a knife around the sides of the cakes, and turn them out onto the rack to cool. Beat together the EB and shortening until well mixed, light and fluffy. Then slowly add the powdered sugar and continue beating to mix well. Add the lemon juice and, finally, beat on medium speed for 5 minutes. Using a sharp serrated knife and a gentle sawing motion, slice each layer horizontally in half. 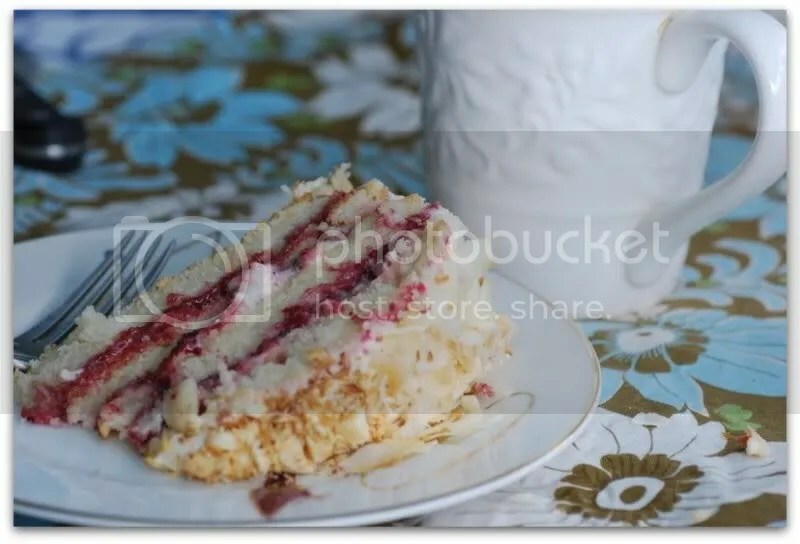 Put one layer cut side up on your cake stand or plate. Spread it with one third of the preserves. Cover the jam evenly with about one quarter of the buttercream. Top with another layer, spread with preserves and buttercream and then do the same with a third layer (you’ll have used all the jam and have buttercream leftover). Place the last layer cut side down on top of the cake and use the remaining buttercream to frost the sides and top. Press the mac nuts into the center of the cake. Press the coconut into the frosting around the nuts, patting it gently all over the sides and top. WOW! I’m stunned this is a beautiful cake! well done! Your cake turned out beautifully. I love all the toasted coconut covering it. Great job! Look at this beautiful cake! I remain humbly amazed at all the work done to alter baked good to fit a particular diet or lifestyle. I am soooooo in line for this cake. Nice job! And my wedding cake wasn’t too far off this cake, which means that after freezing the top layer for a year, we enjoyed it on our first anniversary and it was very, very good. So, next time…cut into servings, wrap and freeze separately and you have treats for a while! Wow…this is great, and impressive that it is veganized! onderful! That looks gorgeous! Job well done…it is very impressive! Your cake looks good enough to eat 🙂 Great job! I’m jealous. My vegan cake really didn’t work. But I see you really altered the cake recipe itself. I joined DB to get myself to think about baking again (I pretty much stopped completely baking when we became vegan). Any tips you might care to share would be greatly appreciated. Your cake looks delightful Gail. Extra congrats for making it vegan. YUM! 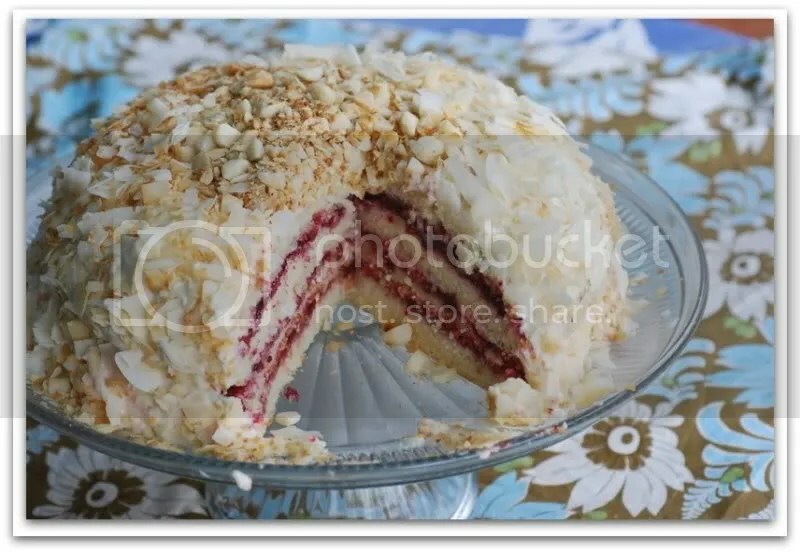 Wow, what a great idea with the toasted coconut and the macadamia nuts on the frosting! Oh goodness that looks delicious! on March 31, 2008 at 4:31 am | Reply Amy J. Beautiful! The coconut/macadamia combo on the outside looks really cool. Love the macadamia nuts on the frosting! Thank you all for the kind comments! I love that these monthly challenges introduce me to so many new people! Jane – I’m sorry to hear that this month’s recipe didn’t work out for you. I find that sometimes I have to be pretty liberal in my interpretations of non-vegan recipes, but I can usually get there in the end 🙂 Since giving up dairy almost three years ago, I’ve learned what substitutions work best for me through lots of internet reading (there are so many useful blogs and articles out there!) and through trial and error. When it comes to baking, I substitute soymilk and Earth Balance directly for milk and butter. I prefer soy yogurt to any other egg substitutes – 1/4 cup yogurt per egg. I find that it makes baked goods really moist and avoids the dreaded “vegan texture” that so many non-vegans have come to expect from vegan baked goods. For buttermilk, cider vinegar curdles up soymilk nicely and makes a great substitute. I’ve also found good substitutions for heavy cream and condensed milk. The thing I love most about vegan baking (other than the deliciousness) is the creative problem solving that goes along with it! 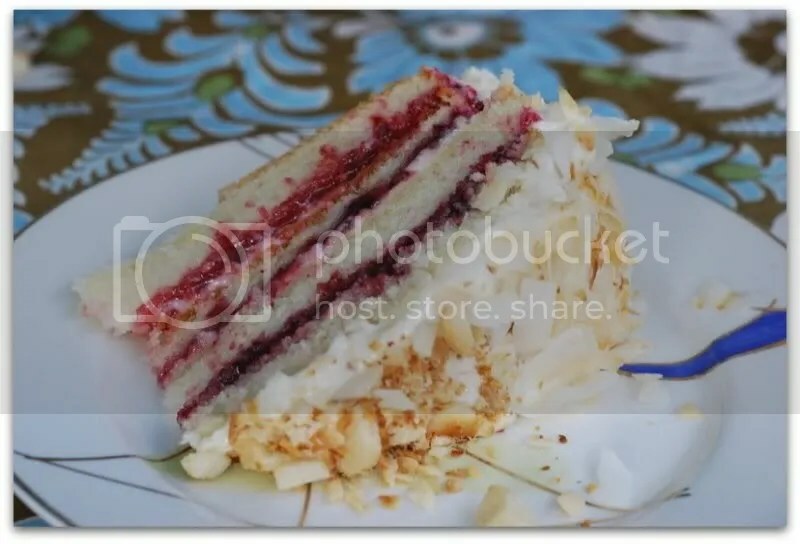 I love how the cake looks with the nuts and toasted coconut. Beautiful job. Excellent work on this month’s Daring Baker’s Challenge – looks WONDERFUL!! By the way, I JUST discovered your blog – I love it!! Your photography and baking/cooking skills are impeccable and inspiring. This cake is perfect for making multiple versions – i hope to make another one this month sometime. Nice job here! Very nicely done! I love the pictures and I’m so impressed by the subsitutions you made! Thanks for the suggestions Gail. I’ll definitely try the soy yogurt next time I bake something. what a delightful looking cake. so elegant, i’m sure you impressed everyone with it! Mahalo to everyone for the wonderful comments! You have all truly made my day! Thank you for that. i just stumbled upon the DB and sent in my request to join the group…which is quite fitting for me as i have been on a quest to veganize every baking recipe i can! i gave up diary about three years ago also, and have found that there is really lots of ways to bake without milk. however, once i gave up eggs (about a year and a half ago) i’ve run into a bit more problems. i use a lot of ener-g egg replace, but find that i can’t make a vegan pound cake with it…or a good standard cake mix cake. i want to try your replacement of soy yogurt, is there a limit to how many yogurt eggs you can replace? i have a very sensitive tummy so i try and stand clear of the tofu eggs, flaxseed eggs and banana eggs. i can’t wait to join the group and look forward to banding with all you alternative bakers out there. thanks for the awesome tip…i’ll be trying it this week! i had to come back and drop you another line…i just finished baking the cake and did your substitutions…and this has to be one of the best cakes i’ve had! i can’t thank you enough, the yogurt worked perfectly and the crumb of the cake was awesome. Hi! I was surfing and found your blog post… nice! I love your blog. 🙂 Cheers! Sandra. R.
Sign: zdbrw Hello!!! mrwuw and 3324avxfbmcucn and 6163 : Sorry, what did you mean?? A?? All personal images and words are copyrighted. Readers are very welcomed and encouraged to link to this blog. Please do not take any of my photos, texts, or other content for commercial use without my permission. An old version of this blog existed in a previous incarnation on Blogger from November 2005 to December 2007. If you are interested in any posts from the archives, please contact me.